Jim Kelly’s “Black Belt Jones” was such a beloved Blaxplotation/Martial Arts Movie hit and so enjoyed by so many people that over the years that whenever I get into a discussion about it with other enthusiasts of those movie genres I always get asked why a sequel was never made. And I would always answer that there actually was a sequel made as I distinctly remember seeing it in a 42end Street grindhouse back in the late 70’s/early 80’s. But the movie never was billed or publicized as the sequel to “Black Belt Jones” and to be honest, it’s such a dismal and disappointing letdown that word of mouth most likely killed it back then. And for the longest time it wasn’t available on home video on VHS so it never got a chance to be seen even then. I saw it a couple of times of HBO during the 1980’s which kept my memories of it alive. I was only able to see it again for the first time since then thanks to the Warner Brothers 4 Film Favorites: Urban Action Collection. I got my copy a few years ago in Target and paid $9.99 for it. I’m fairly certain you can get it for five bucks now. It’s well worth getting for the excellent “Black Belt Jones” “Three The Hard Way” and “Black Samson.” Yeah, HOT POTATO is the real stinker in the bunch but I still say it’s worth buying the collection. You get three really great Blaxploitation classics for five bucks and to me that’s putting up with one that wouldn’t be worth buying if it were packaged on its own. What I don’t go along with is the utter and total lack of charm, wit, talent and humor in HOT POTATO that made “Black Belt Jones” such a wonderful piece of entertainment. There’s a couple of scenes early in the movie that indicate that Johnny Chicago and The Rhino could have been a Monk and Ham style pair of sidekicks but Geoffrey Benney is such a stiff and George Mommelli is such a cartoon character that there is nothing about them that can be taken seriously. George Mommelli really surprised me at how bad he was in this movie as he was so entertaining in other movies I’ve seen him such as Martin Scorsese’s “Mean Streets” and “Phantom of The Paradise.” The Rhino wears a picnic tablecloth as a poncho and for the whole movie his shtick is that he’s a fat, sweaty, uncouth slob. The only thing I liked about his character was that much like the Joe Don Baker character in “Golden Needles” he’s not a martial artist. He’s a barroom brawler and that makes for an interesting contrast in fighting styles during his fight scenes. Johnny Chicago has an intriguing background that is touched upon that due to his wife and daughter being blown up by a car bomb meant for him he has given up on relationships and is now only interested in working for money but nothing much is done with that. As a writer I hate to see characters wasted and these were two characters that really could have been standouts. 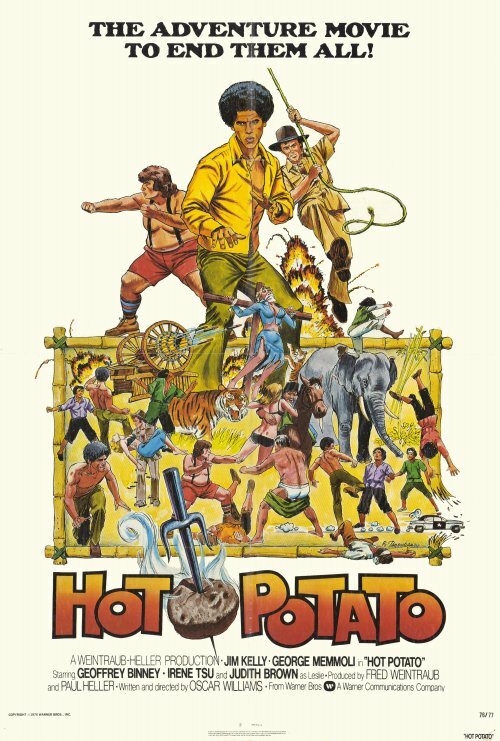 The most disappointing thing about HOT POTATO is the fight scenes. And if you can’t depend upon fight scenes in a martial arts movie then you’re screwed. There are numerous fight scenes where the bad guys simply stand there and let Jim Kelly beat up on them. And it doesn’t help that the fight scenes have ridiculous slide whistle sound effects when Kelly leaps through the air or when punches are thrown. The bad guy (Sam Hiona) has the great name of Carter Rangoon but that’s the only thing he’s got going for him. The final confrontation between him and Black Belt Jones is lacking in any suspense whatsoever and when you see in the credits that Jim Kelly staged his own fight sequences you kinda understand why. There is no point to talking about the acting is this movie because nobody is even trying to act in anything approaching a level to engage us on even an It’s So Bad It’s Good level. Let’s cut to the chase here and save us all time. Should you see HOT POTATO? If you had to purchase it by itself, I would say absolutely not. But since it’s packaged along with three really good movies I say put it on and let it play while you go about your household chores. It’s a disappointing movie totally unworthy of the charm and talent of Jim Kelly and everybody associated with it. 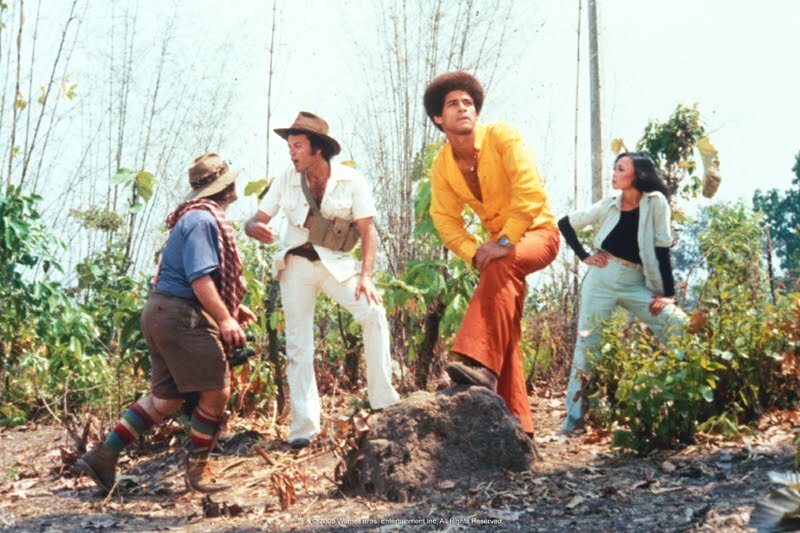 It further doesn’t help that the music score frequently rips off the familiar “Enter The Dragon” theme song during the poorly choreographed fight scenes to try and remind you of that far better movie. It’s funny that another of Jim Kelly’s Movies The Tattoo Connection (original title E yu tou hei sha xing) was marketed as Black Belt Jones 2.